28 year-old Tina* was referred to the Domestic Violence Support Center (DVSC) by the District of Columbia Child and Family Services Agency. 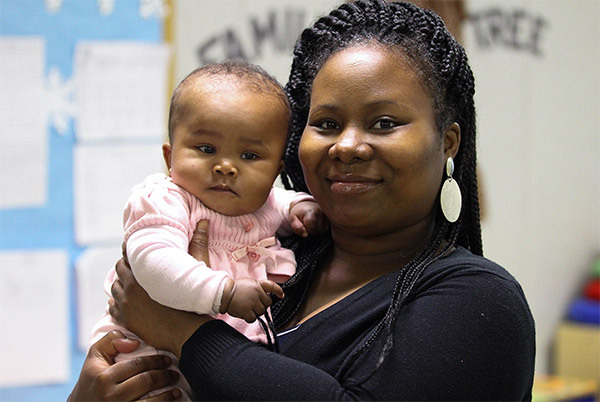 When Tina came to the DVSC, her children had been out of her care for nearly 14 months. Her two children, ages three and four years old, had been placed in a foster care setting after an anonymous report led police to discover she had left them in her apartment unattended while they were sleeping. At the time, Tina had gone to meet the children’s father because he said he wanted to give her some things he had gotten for the children. Tina later discovered that he was the one who had called the police to report her absence. Despite her anger, and the court’s concern that her interactions with their father jeopardized the well-being of the children, Tina struggled to limit her contact with him, and to complete the parenting classes and counseling required for her to regain custody of her children. However, once she connected with the DVSC, Tina was able to focus her energies on taking care of herself and completing the requirements to reunify with her children. On reflecting with her counselor, Tina realized it was her lifelong history of abusive relationships, and fear of parenting on her own, that kept her tied to her children’s father. By working with her DVSC counselor, Tina was able to break down the process of completing the court-ordered services into manageable goals, and create specific strategies for staying on track. Tina was also able to see increasingly how her children’s father had sabotaged her efforts to parent, work, and further her education by constantly creating ‘fires’ for her to put out. As a result, Tina and her counselor developed some concrete strategies for helping her to take care of herself and her children first, and their father secondarily, if at all. Tina’s gains came quickly, after only six months working with her counselor, she was able to set and continue supporting stronger boundaries, and allow her to allocate her resources in a way that would be most beneficial to her and her children in the long run.